The best bird of my weekend was undoubtedly the Red-tailed Hawk that took an American Crow right outside my window. Wicked! 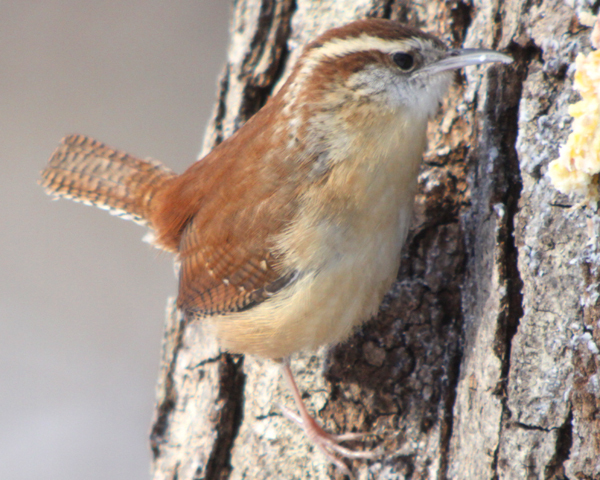 Corey found favor with the normal Forest Park feeder birds after a big NYC snowstorm, like the Carolina Wren featured below. Last but not least, Charlie is mad about the Mistle Thrush that has claimed the yew trees at the bottom of his garden. It was cold and windy at Bosque del Apache on Saturday morning. Even the expected species were keeping under cover. Just before heading over to the Owl Cafe for a green-chile cheeseburger about 11:30 a.m., I stopped at the little pond right by the entrance booth. I was delighted to see two Greater White-fronted Geese, an adult & a sub-adult. This species is not a regular winter resident, though not unprecedented. I did just now notice that someone else reported two birds to eBird also on the 19th. Same two individuals, I wonder? Slow birding for me this weekend with the snow and all. Even my feeder birds were hiding from it. I guess the highlight would be the 2 Goldfinches that seem to have returned to my nyjer feeder. Interestingly, I had moved it a foot to the left and on a slightly lower hook a month ago and they stopped coming. I moved it back to its original spot on Saturday and they’re back. Patrick — I think your goldfinches have issues. My best bird was a Black-necked Stilt on the Vicksburg Christmas Bird Count — a new species for the count. Laughing Gull, White Ibis, and American White Pelican were also awesome. My best bird was a Hermit Thrush during the Comox CBC on December 20. We also flushed a pair of Wilson’s Snipe but unfortunately had strayed out of our area and into an adjacent one so couldn’t count them!